The syndicated entertainment news show, Hollywood Today Live! has been cancelled. BiteSizeTV owner, Nexstar Media Group, decided to end the low-rated TV series, to concentrate on local programming. The Hollywood Today Live! TV series finale will air on April 28, 2017. A one-hour news magazine show currently in its second season, Hollywood Today Live! kicked off on Fox-owned television stations in July 2014. Garcelle Beauvais, Ross Mathews, and Tanner Thomason co-host. Amanda Salas serves as red carpet correspondent. Checkout the Nexstar Media Group press release for more details. LOS ANGELES, California and IRVING, Texas – Nexstar Media Group, Inc. (Nasdaq: NXST) (“Nexstar” or “The Company”) announced today that plans are underway to bring the strategy for BiteSizeTV in alignment with the Company’s organization-wide commitment to local programming and content production. As a result, its wholly-owned subsidiary, Nexstar Broadcasting, Inc. (“Nexstar Broadcasting”) and FOX Television Stations, Inc. (“FOX”) will end Hollywood Today LIVE!, a one-hour, nationally syndicated daily entertainment news and talk variety show produced by BiteSizeTV. The final telecast of Hollywood Today LIVE! will air on April 28, 2017. Nexstar obtained BiteSizeTV as part of its acquisition of Media General Inc. earlier this year. Hollywood Today LIVE! began as a pilot program on FOX-owned television stations in July 2014. Following its initial debut, Media General and FOX launched Season 1 of the nationally syndicated show across their respective broadcast platforms in September 2015 and Season 2 began airing in September 2016. 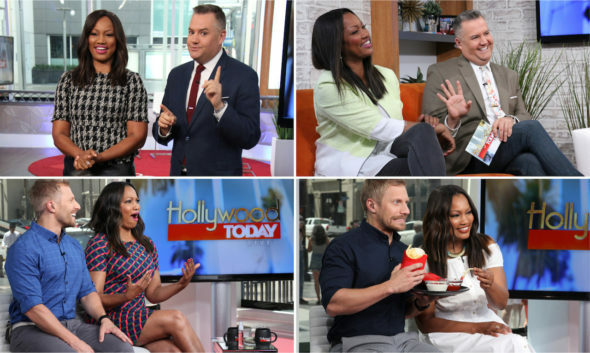 FOX Television and Nexstar conducted a thorough analysis of Hollywood Today LIVE! and were unable to find a sufficient audience to support continued national syndication. What do you think? Do you watch the Hollywood Today Live! TV show? Should it have been cancelled or renewed for season three? I miss Ross and the entire crew. WHY was it cancelled so abruptly? Upsetting!